Anderley has two secluded and romantic cottages located on a rural property of 35 acres in the Strzelecki Ranges in West Gippsland. We are close to Melbourne - just a 90 minute drive. Both cottages have breathtaking views that you can see from every area in the cottage! Ideal for a romantic getaway, a quiet retreat from the busy city life or some quality time away. Anderley is the perfect place to retreat and recharge. 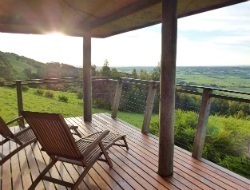 The self-contained cottages are designed to take full advantage of the spectacular Gippsland views. Both cottages have a cosy wood fire, a double spa bath and an expansive deck where you can sit back and enjoy the rural aspect. Ideal for a short break or as a great base to stay longer and explore more of the Gippsland region. Anderley is only 5km from the popular tourist village of Yarragon which is renowned for its unique shops and eateries.